Spot Gold Price: The UK economy is by no means out of the woods. The Chancellor George Osborne warns today that the UK faces a "cocktail" of serious threats from a slowing global economy, writes bullion expert Oliver Temple. The Chancellor says that 2016 will be far from "mission accomplished" on the economy – this is despite of what many had felt had been a positive Autumn statement. He suggests 2016 is likely to be one of the toughest since the economic downturn. How will the spot gold price in 2016 be affected? During economic uncertainty the precious metal has traditionally been seen as safe haven. In truth, however, gold has been increasingly hard to predict for many analysts. In theory, last year there were the ‘perfect’ ingredients for the yellow metal to make significant gains – the Greece bailout situation, the falling yuan and the uncertainty around the possible interest rate rise in the US. And yet the precious metal did not react as many had expected – the spot gold price fell in August before climbing slowly again. Our view has been that some investors have been holding off from buying gold generally. Perhaps some had felt confident about a US interest rate rise and were also waiting to see what would happen with the global economy. Interest rate rises can be an indicator that an economy is healthy. This theory about investors waiting seems to have been proved right for 2015. We have now seen the yellow metal edging up in London in the first week of 2016. At the start of the week, spot gold prices rose to around $1,077 in London and in New York at $1,075. What then is driving this latest spark and will it last? It is important to remember that gold is not tied to one particular factor. This time, I believe investors are turning to the precious metal because of the Chinese falling stocks and its impact on other markets. In China shares this week fell by 7% triggering the "circuit-breaker" rule which is designed to stop panic selling. This has had a knock-on effect in other markets. In Germany, the Dax was down 3.56%, or 363.76 points at 9850.26 (its worse since August) and France’s Cac was down 3.17% or 141.83 points, at 4338.64. The slowing China economy may, though, impact the UK’s exports to the country and our own economy. China after all is responsible for 17% of all the world’s economic activity. The yuan, however, being much weaker will have a positive impact for consumers – gold jewellery prices in the UK, for instance, may fall. Then there is the continued conflict in the Middle East. Oil prices have since mid-2014 dropped by two-thirds. Other commodities have also fallen sharply such as gas and iron ore – all signs of a weakening global economy. The Chancellor is concerned about the global economy and so to, it seems, are savvy investors who are looking at ways of protecting their portfolios at a time when the gold price is relatively low. Gold is beginning to shine again for investors. No one can predict exactly how gold will perform this year and it has certainly confused many analysts. Our view is to regard the precious metal as a medium to long-term investment, and similar to insurance. 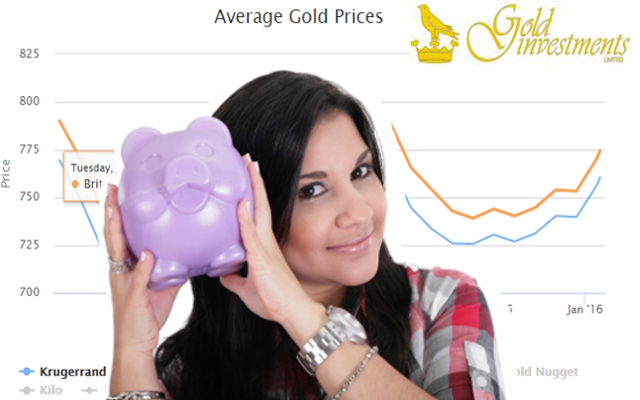 You can track the average spot gold price here. If you would like to talk about your gold investment options, I, together with my colleagues, would be happy to advise over a coffee if you would like. We’re one of the oldest bullion houses in the UK – trading since 1981 – with our offices situated in the City. We are trusted by our many loyal customers.